On Saturday, we returned home from baseballs games and were then stuck inside because of rain. I checked out the message board at Personal Scrapper and saw that someone posted a challenge to use a specific July PageMaps. "Practice Makes Perfect" is the LO I completed for that challenge. I already had these four pics on my desk and cropped them and altered the sketch to fit them. 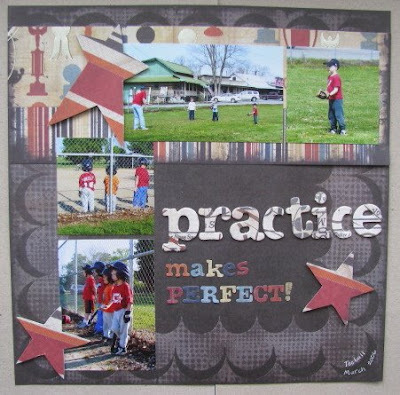 I used a paper pack/slab by We R Memory Keepers - their MVP line - that I picked up at Michael's a while back for around $10 by using a 50% off coupon. When I checked out the PageMaps site to see the sketch, I realized I loved all ten of the July sketches. I spent last night and some time this morning scrapping to use all of the sketches. 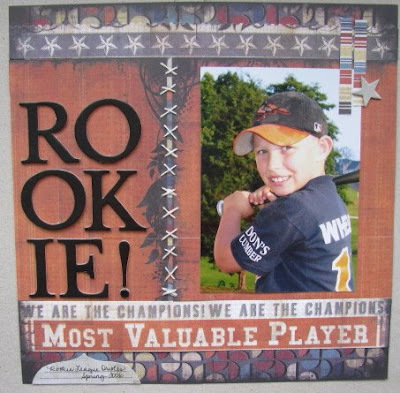 I continued using the WRMK MVP line and various sports pics from the boys' 2006 season. 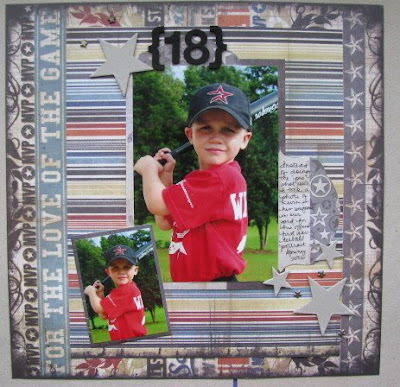 Everything for "Tournament Time" was included in the MVP slab except for the diecut journaling cards (from the same line) that I picked up at Archiver's. 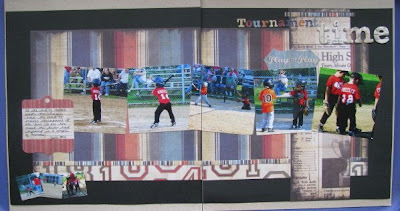 These pics are from Kevin's first year of teeball - he's grown so much!!! 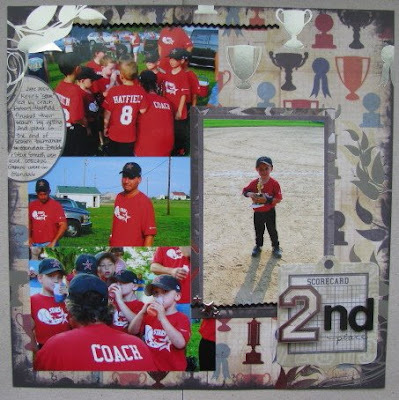 "2nd place" uses the slab, a couple journaling cards, some vintage rick rack, and American Crafts foam Thickers ("nd"). The "2" is a cut out from a piece of patterned paper that I raised up with pop dots. 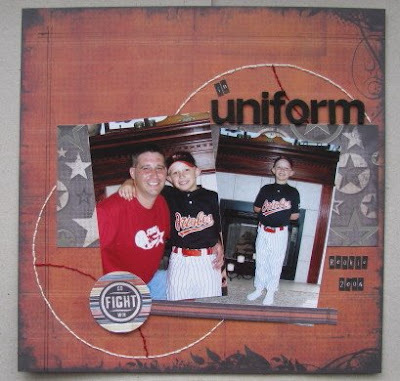 It's hard to tell from this photo, but "first uniform" has a row of stars above the photos that I punched out with my old Creative Memories star punches. Some are raised up with pop dots. I remember how excited Kevin was to get his first official uniform! I love how "Rookie" turned out. Sometimes it's hard to scrap posed photos. I turned the sketch I used for this LO on it's side. It was also an 8-1/2"x11" sketch that I altered into a 12x12. It's one of my favorites. "Night Games" documents a big thrill for the boys - playing under the lights. It's hard to believe that in these pics Blake was the age Kevin is now! It looks like there is a red circle with a star in the center of this LO, but the circle is actually silver. I think it might have picked up the reflection of my red shirt! The sketch I used for "18" appeared pretty girly, but I added stars to toughen it up! I don't usually use the same photo twice on a page (it's a pet peeve of mine), but I thought it worked ok here. "Sideline 2006" is of a couple random shots I had from Kevin watching Blake's games. I liked using the newspaper patterned paper. The sketch I used for "Champs" was actually a 2-page 8-1/2"x11" LO that I made into a 2-page 12x12 LO. It's probably the sketch I altered the most to accomodate all my photos. These are good memories! I was able to use my Bazzill stitching templates for "in uniform". I tried to get creative and make the circles in the sketch into baseballs. Usually I have so many sports photos that I am overwhelmed when I try to scrap them. I might just have to pull up the PageMaps archives to see if another month of sketches will inspire me to scrap more of my huge collection of sports photos! Wow! I love thse pages. They all turned out really cute. I also think that the same photo looks great there. I never do that either...but did it myself this week with my choices page. Weird. Can't wait to see what else you come up with! Awesome work Amy, you've inspired me to use some of those sketches, I do love using the Page Maps sketches, and this month's were all really fun I thought! Thanks for sharing with us! Amy--awesome job!! I love that you used all of the maps from this month. You are so talented! And--what a compliment to get a comment from Becky herself! Great pages Amy! Glad I got your creative juices flowing! Great job Amy! Love those pages! You make me want to scrap my baseball photos! Great pages Amy! Love the "Rookie" one. 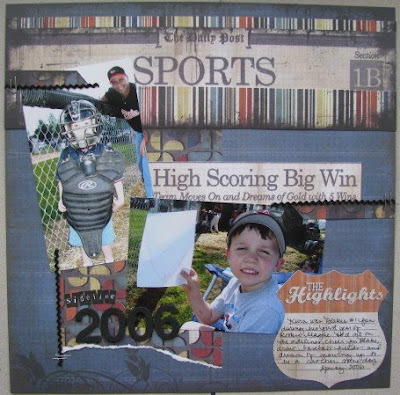 I hope my boys get into sports soon so I can do some cute sporty pages! Great pages Amy! You rocked those maps! Those are such great layouts! 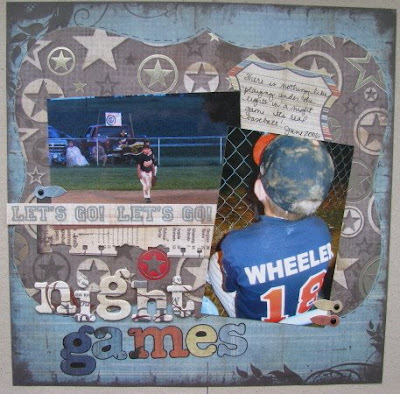 I love the :Night games" captures night baseball so well! Good job!